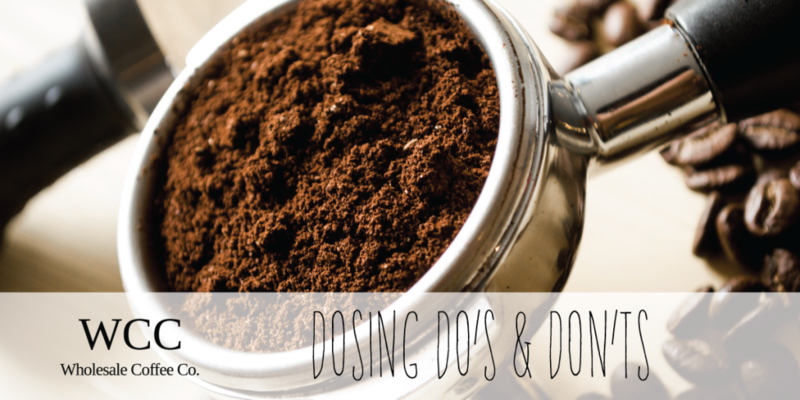 Dosing Do’s & Don’ts | Wholesale Coffee Co.
Today we are going to tackle the first step of making a good coffee and one that is often left by the wayside, Dosing. What we will do is break the process down into steps with a simple explanation (where necessary) for why each step is important along the way. At the end of the day all of these steps encourage one thing and that is a higher level of quality control not just for one staff member but for your whole team. This one is pretty self explanatory, aiming for the middle of the basket is the best way to get an even dispersal of grinds and it’s also the easiest way to stay clean and tidy. If you’re dosing off to the side there’s a good chance you’ll lose coffee off the edge and although it may only be a gram or two each time it adds up. Settling is one of two actions, some people like to shake the handle as the coffee goes in to stop it coming out, some people like to tap the handle at the end to “settle” the grinds in. Both of these options are great as long as everyone on the team does the same thing. If one person shakes 2 time and another shakes 5 the coffee will pour slower or faster. Figure out what works for you and your team and make sure everyone does the same thing across the board. Once you have a mountain of coffee in your basket it’s a good idea to flatten your coffee out. The coffee should perfectly fill the basket, by flattening the coffee out you now know whether you’ve got the right amount, If you’re having to get rid of coffee you need to dose less and if there’s not enough to fill the basket you need more. Water will always take the path of least resistance so the other advantage to flattening the grinds out is they are evenly dispersed across the whole basket. If you tamp the coffee while it’s still a mountain the grinds are more dense in the centre than around the outside edges so the water will miss the centre and you’ll lose a lot of flavour. These four steps if agreed upon and followed by your whole team can improve quality and consistency cup to cup and more importantly barista to barista.